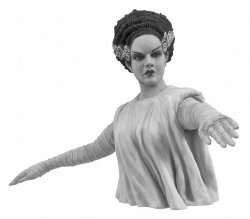 Latest release in Diamond Select's new line of vinyl banks: The Bride of Frankenstein Silver Screen version in classic black and white just like in the original Universal Monsters film! Sculpted by Gabriel Marquez. The Monster needs his mate. Whether or not you already have DST's vinyl bust bank of Frankenstein's Monster, no monster collection can possibly be without this B&W 9-inch portrait of his Bride. Inspired by the classic film, the Bride features collectible-quality paint and sculpting, as well as a conveniently placed coin slot in back. Also available in a color version. 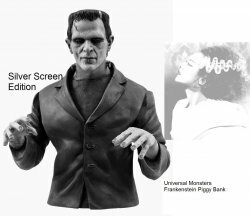 Also want the Frankenstein Silver Screen B&W Bust Bank (color versions also available while supplies last)? Click the convenient Buy Both button below!